If you suffer from allergies, this information could change your life. Remarkable relief is now possible using NAET, an innovative, highly effect technique that eliminates allergies of all types.What is NAET? Computerized testing and/or kinesiological muscle response testing (MRT) is used to determine the allergic substance, or allergen, causing the allergic reaction. Once the allergen has been identified, a technique consisting of spinal stimulation is used to desensitize the patient to the allergen. The treatment essentially reprograms the brain and nervous system to no longer react to the treated allergen. Once the body accepts reprogramming, it heals itself. What kinds of allergies does NAET treat? At our facility, we utilize the latest diagnostic equipment including a computerized, non-invasive testing system designed especially to determine allergic sensitivities of all kinds. Over 8,000 substances can be tested safely without risk of provoking allergic responses. For 25 hours after the treatment it is essential that the patient does not come into close contact with the allergen treated. This gives the body time to absorb and maintain the treatment. At the next treatment the allergen is retested to see if the treatment has held. Reactions to treatment vary from one patient to another. Some patients report feeling better immediately while others may fell slightly fatigued. Testing will allow your acupuncturist to identify the number of allergens that need to be treated. One allergen is treated at a time and usually a single treatment clears each allergen. Some patients require only a few treatments. Patients with long-term health problems and multiple underlying allergies may require a longer course of treatment. 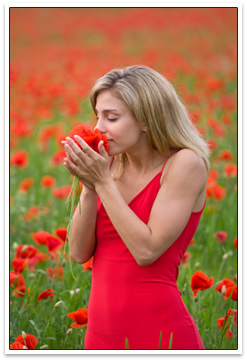 How does NAET differ from Western Medicine treatment for allergies? Western medicine attributes allergies to an over-reactive immune system where an allergic person is highly sensitive to substances that are often harmless to the majority of individuals. Western medical treatment involves drug therapy (antihistamines or steroids) to control allergic symptoms. This approach does not correct the underlying problem and can lead to side effects.NAET views allergies from a holistic perspective based on Chinese medical theory which sees an allergic response as an energy flow irregularity interfering with normal nervous system communication. NAET treats the cause of allergies by reprogramming the body’s response to the identified allergen. A full hour is scheduled for an initial visit. Your first appointment will include a complete review of your medical history, testing, and your first treatment. Can children be treated with NAET? NAET is safe and effective for people of all ages…children, infants, the elderly and pregnant women. What kind of Certification is needed to Practice NAET? Only doctors of Medicine, Chiropractic, Acupuncture, Dentistry, Naturopathy, and registered Nurses sponsored by a doctor are eligible for NAET training. Qualified practitioners receive required training in NAET theory and methods. Additional workshops and seminars provide continued training at intermediate and advanced levels. A practitioner’s training credentials can be viewed at the NAET website (www.naet.com). Why haven’t I heard more about NAET? By medical standards, NEAT is quite new and therefore, like many alternative treatments, it is not yet well-known among traditional doctors. While more that 8,000 doctors practice NAET world-wide, that is still a relatively small number. NAET has been a revelation for me. Growing up I tended to have many strange reactions to the foods that I ate. I got used to feeling sick after almost every meal. It seemed like my problems were genetic and I would have to live with them for the rest of my life. Thankfully my wife discovered NAET and convinced me to start treatments. My initial response was relief at finally being able to understand the health issues that I felt were akin to medical mysteries. With NAET I was able to reduce and eliminate the allergies that were affecting my quality of life. My breathing is better, I have fewer headaches, and I can eat anything I want. Starting NAET has been like the beginning of a journey and I can’t imagine a better team to start NAET travels with than Joan and Patricia. Joan keep the treatment process simple, tailors the treatments to your needs, and acts like a detective in figuring out the source of your allergic reactions. Patricia handles questions with ease and is so helpful in scheduling appointments with lots of flexibility. NAET has helped me to learn what was causing such odd physical reactions and allowed me to overcome them. I am thrilled. When I made my first appointment with Joan Gregory, I had been suffering from a chronic cough and extreme fatigue for more than 8 months. I had been to several doctors and been tested in a variety of ways. I was treated with steroids, cough medicines, decongestants, analgesics, allergy medications and inhalers. Nothing was helping. When I met Joan and Patricia for the first time, I left with hope that I could return to a state of good health. I developed Adult Asthma when I was in my 60s. Soon I was taking 3 puffs a day on an inhaler, plus other daily medications. I also was taking medication for acid reflux. I knew about NAET because my grandson had been successfully treated for serious food allergies, so I decided to give NAET a try. After 6 basic treatments the asthma seemed to be lessening to the extent that I didn’t need to use the inhaler anymore, and after 8 treatments I did away with the prescription medications. Soon after that the acid reflux was gone and I no longer needed that medication. Going for NAET treatments has made a definite improvement in my life. Even though insurance does not cover my treatments I have saved money by not paying for medications and inhalers. I fell physically WELL again. Spring allergy season used to be miserable for me. For two to four months out of the year, my eyes and throat itched incessantly. “Why not try NAET?” I thought. After trying several air borne allergens, I was treated for some tree pollens and felt relief by the next day. Now I have just a few itchy days, and I know if I devoted the time to more NAET treatments, those would clear up as well. For most of my adult life dairy products have been difficult for me to digest. In recent years the consequences of consuming dairy products were increasingly unpleasant. It became necessary to really limit my intake of milk, cheese, and yogurt. Ice cream, cottage cheese, and sour cream had to be avoided entirely. I was treated for Lactose intolerance at the Acupuncture & Allergy Center. The treatment was painless and surprisingly simple. At first I was really cautious in testing the outcome, but soon I realized there was no longer any need for limitations on my diet. Now I enjoy a wide range of dairy products; milk with my cereal, ice cream with my pie, yogurt with my fruit, and sour cream with my baked potato. I am no longer lactose intolerant! My husband and I began NAET treatments because we wanted relief from seasonal allergies. We got that relief, and we found that NAET was more than a cure for pollen-related symptoms. For example, I have a long history of bladder infections. The doctors typically prescribed antibiotics which got rid of the symptoms, but the infections kept coming back. Frequently I was bedridden because of the intense spasms I experienced. After three NAET treatments I don’t have to deal with that anymore. Imagine what it means to me to be free of this problem for the first time in my adult life! Over time my husband began to suffer from food allergies. First it was avocados, then cantaloupe, then other melons, then bananas, and on and on. If he ate even a small amount of the offending food he became nauseous. After NAET treatments he can eat all of these foods as often as he wants. Years ago, I was hospitalized with a severe inner ear infection. Ever since, I have been subject to spells of vertigo. I have to avoid any motion related activities, even watching someone on a swing or merry-go-round can make me dizzy. I can’t ride in the backseat of a car or turn my head quickly. I have to be careful bending over and I can’t sleep with my head lower than my shoulders. On occasion, I have been so dizzy that it was difficult to walk, and a few times my dizziness resulted in vomiting and diarrhea. To recover from these spells I usually have to lie in bed as still as possible, sometimes for most of the day. Medication has never helped. My wife encouraged me to visit Joan Gregory, a NEAT practitioner, who had successfully treated her for allergies. After receiving a couple of NAET treatments my head and sense of balance have a normal feeling. I am no longer light headed. I’m able to turn my head quickly with no harmful effects, and I also believe I’m sleeping better. I’m amazed, and most thankful. My son had recurring skin warts. When they started to appear around his mouth, we had them removed by a dermatologist. They returned and we continued to visit a dermatologist off and on, but the warts would always return. We had experienced great results using NAET to treat my daughter’s food allergies, so I decided to try NAET on my son’s warts. It wasn’t an immediate fix. Wart varieties are numerous and other factors can contribute to the problem. But, Ms. Gregory was persistent and she found a combination that worked. His warts went away. It has been two years now, and they have not returned.